In this tutorial I am going to show you how to create simple colorful Logo with Prestige Elite Std (default) font and Layer Styles. To achieve the final result we'll be using also Hard Square and Concentric Circles Brushes as well as Pen Tool to create Path. 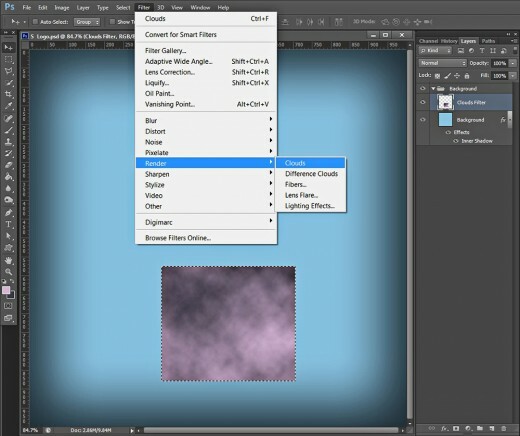 While following the steps of the tutorial you will learn how to create cool Background using two default filters- Clouds and Difference Clouds. You also have to apply Inner Shadow Layer Style and Free Transform to give the final mystic look to the Logo Background. All Photoshop versions can be used. Firstly you have to create a square canvas. For the purpose open your Photoshop, look at the Menu bar and select File, New. Insert S Logo for Name, set the Width and Height to 1000 Pixels both, then change the Resolution to 96 Pixels/Inch. 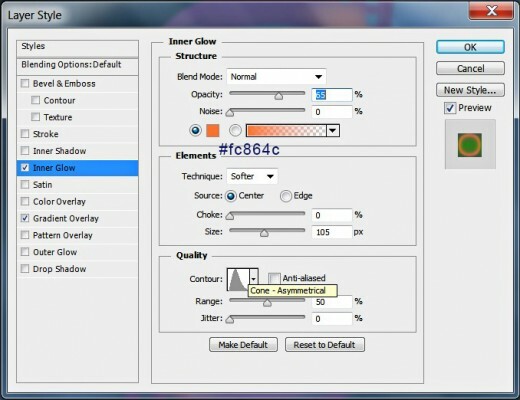 Choose RGB Color for Color Mode and Transparent for Background Contents. 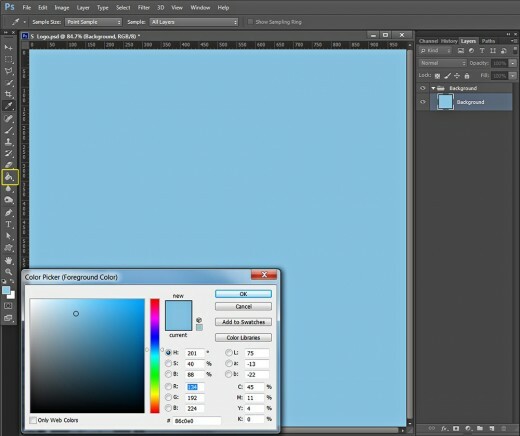 Click on the Layer 1 name and insert Background then press Ctrl+G to put this Background layer in a group. Rename Group 1 to Background too. 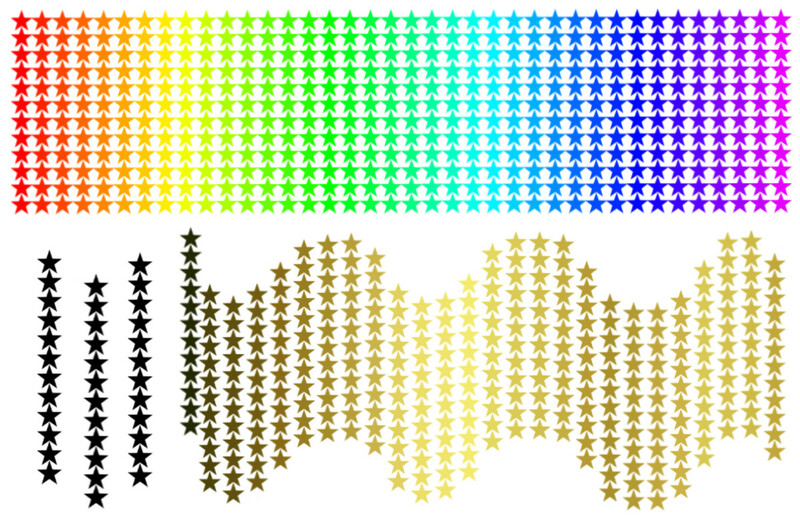 In Steps 2-8 you are going to prepare awesome Background for our Logo. You need to colorize your first layer with blue then add Inner Shadow Layer Style to darken the borders of your canvas. You also have to Create a New Layer and apply Clouds and Difference Clouds Filters to texturize the Background. 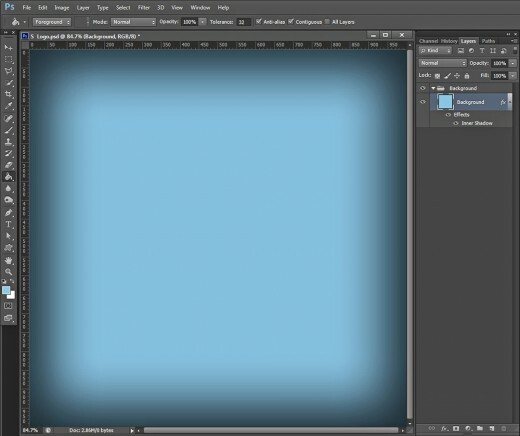 Let us start our work with creating mystic cloudy background for our Logo. You should change the Foreground Color to #86c0e0 then grab Paint Bucket Tool and drag once on the canvas to colorize your first layer in Background group. 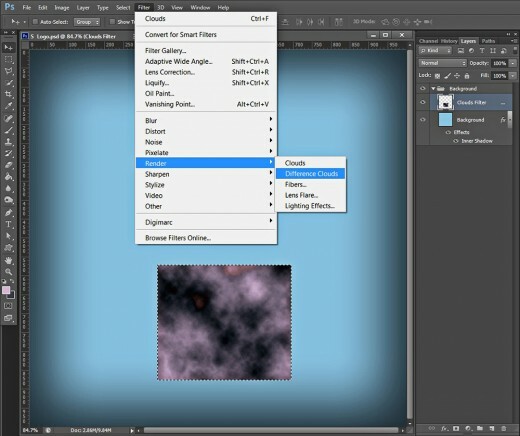 Double click on Background layer's thumbnail or navigate to the Menu bar and select Layer, Layer Style, Blending Options. Check Inner Shadow Layer Style, then lower Distance to 0px, increase Choke to 30% and Size to 200px. This should be the result on your canvas after adding Inner shadow to the blue background. 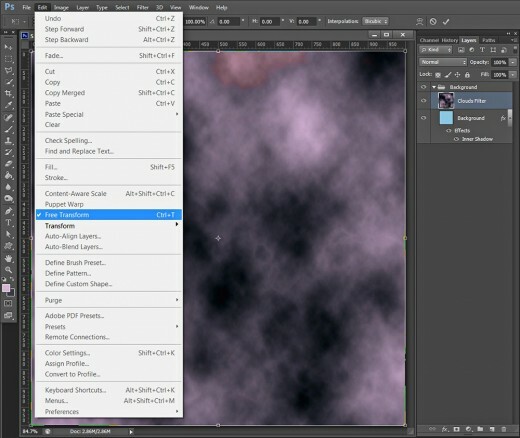 Now create a New Layer on top of Background group and name it Clouds Filter. Change the Foreground Color to #d7b6d3 and Background Color to #423d4b then take Rectangular Marquee Tool and draw a small selection somewhere on your canvas. Navigate to the Menu bar and select Filter, Render, Clouds. You can see on the screenshot below the outcome of using the Filter. Now apply Filter, Render, Difference Clouds, then press Ctrl+F three-four times to repeat the Filter. You should get a result similar to the outcome on my canvas. Press also Ctrl+D to get rid of the selection. Keep Clouds Filter layer highlighted. Go back again to the Menu bar and select Edit, Free Transform. Move the corner nodes to make the clouds cover your canvas. If you are happy with the result, press Enter to apply the Transformation. 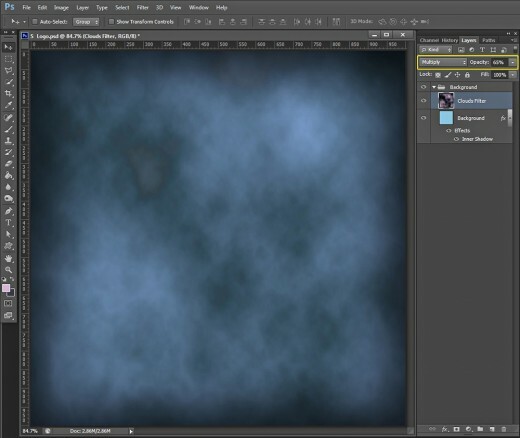 Change Blend Mode of Clouds Filter layer to Multiply and lower its Opacity to 65%. Our cloudy background is ready. In the following two steps your simple task is to type S letter with default Font then Rasterize its layer. In this step we'll start to create the Logo itself. So grab Horizontal Type Tool, find the default font Prestige Elite Std from the Font Family drop down menu and set its Size to 800pt. 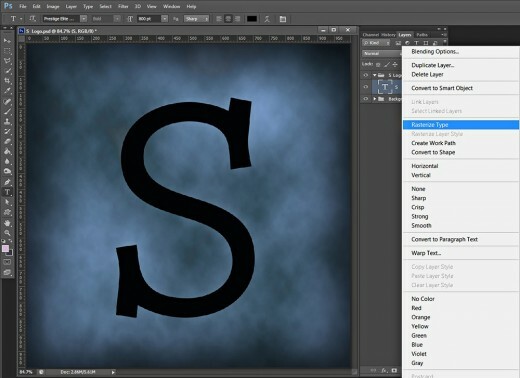 Choose black (#000000) for Text Color then type capital S letter. Now move S Text layer on top of Layers panel and put it in a group called S Logo. 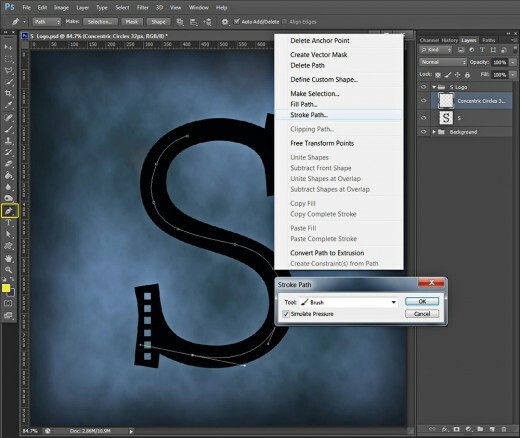 Right click on S Text layer and select Rasterize Type from the fly-out menu. In Steps 11-13 you have to use default Hard Square Brush to create equal number of tiny rectangles at the upper right and bottom left part of the Logo, then you have to Load a Selection on the base of those rectangles and delete the selected parts of the Logo to make the openings. Create a New Layer on top of S Logo group and call it Hard Square 18px after the Brush we are going to use. Choose Foreground Color different than the color of your letter. I decided to use this pink: #feacff, take Brush Tool and find Hard Square Brush of 18px Size in the Brush Preset Picker. 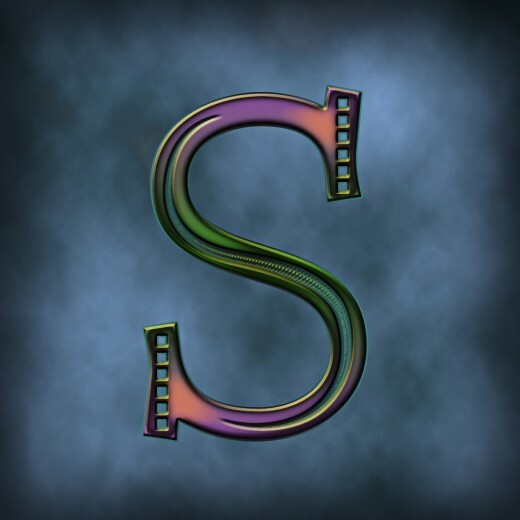 Now click six times to make six pink squares at the upper right part of the S letter. Repeat this at the bottom left part of the letter. There is another way to do the same if you want the squares on both parts to look identical. 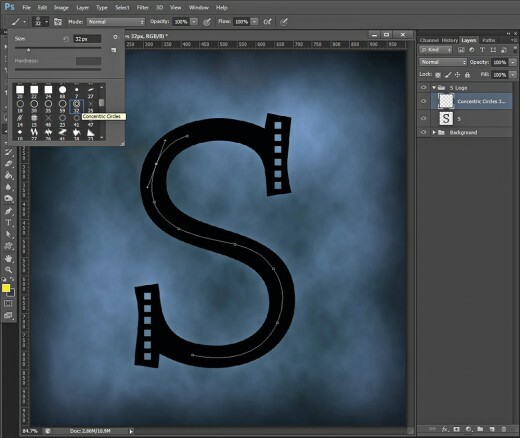 Duplicate the layer and move the copied squares at the bottom left part of the letter, then merge both squares layers. Hold down Ctrl and click on Hard Square 18px layer's thumbnail to Load Selection on the squares. Now highlight S layer and press Delete key. 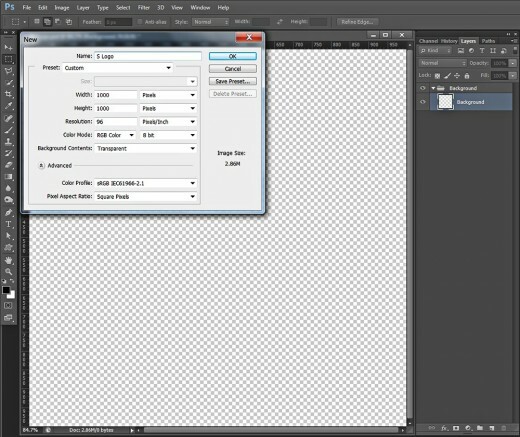 Press also Ctrl+D to remove the selection and delete Hard Square 18px layer. We don't need it anymore. In Step 14-19 your task is to draw S shaped Path using Pen Tool, then you have to stroke that Path with Concentric Circles Brush which is default for Photoshop. After you have deleted the Path, You should Load a Selection on the Concentric Circles Stroke and use it to perforate the middle part of the S Logo. Change your Foreground Color. Just choose a color shade different from the color of the letter to be able to discern the stroked path you are going to create. I have chosen vivid yellow- #fde403. 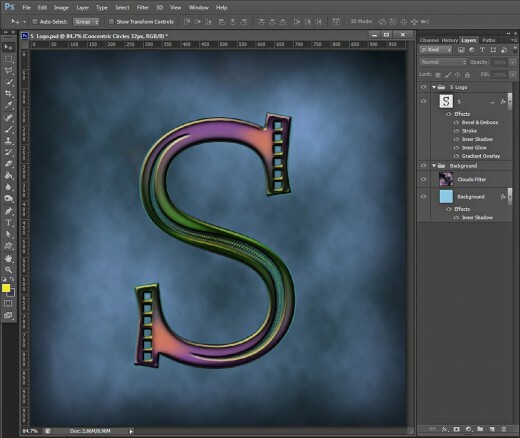 Now Create a New Layer on top of S Logo group and name it Concentric Circles 32px after the Brush we are going to use. Take Pen Tool and draw a path following the shape of the S letter. Use also Convert Point Tool to make the curves smoother. Take Brush Tool and find Concentric Circles Brush of 32px Size among the brushes in the Brush Preset Picker. Reselect Pen tool, right click somewhere on the path and select Stroke Path from the fly-out menu. In Stroke Path box Brush should be selected as a default Tool, Simulate Pressure should be checked too. This is how the Pen Tool Path will look after being stroked with the Concentric Circles Brush. Press Delete key twice to remove the Path. 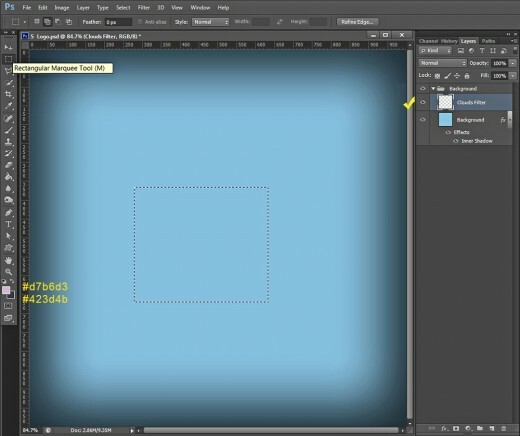 Hold down Ctrl and click on Concentric Circles 32px layer's thumbnail to Load Selection. Now highlight S layer and press Delete key. You can delete Concentric Circles 32px layer as we finished our work with it and press also Ctrl+D to get rid of the selection. Only one S layer should be left in your S Logo group. 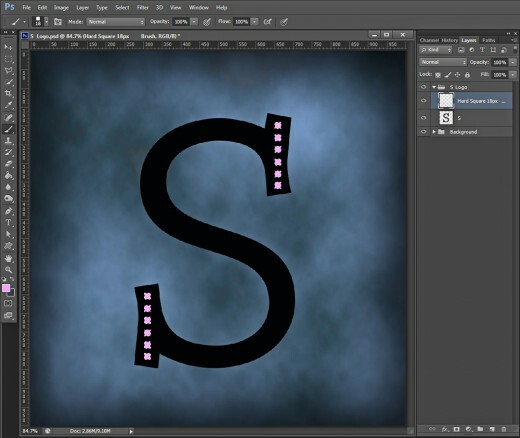 In the coming steps you need to add five layer styles to your S logo layer- Gradient, Glow, Shadow, Stroke and Bevel and Emboss. Thus you’ll create awesome blending colors effect and add 3D look to the Logo. Second Color Stop (Location 100%): #884c99. The Angle of the Gradient should be 90 degrees. Don't close Layer Style box as we have four more Blending Options to apply. 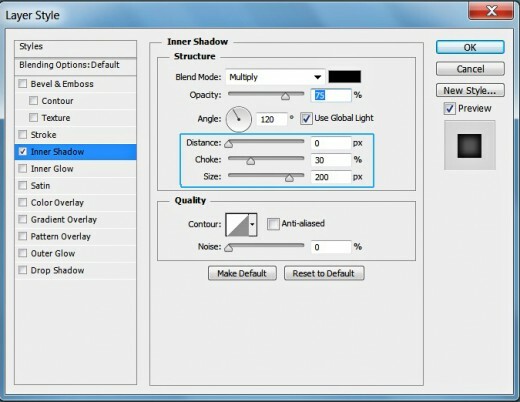 The third Layer Style we have to add to S layer is Inner Shadow. 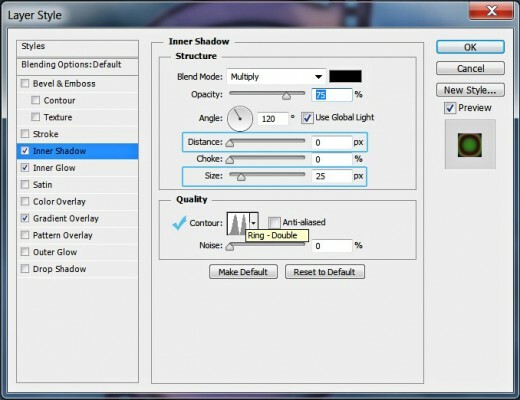 Reduce Distance to 0px, increase Size to 25px and select Ring-Double Contour from the Contour Picker. The last Layer Style to be applied on our Logo is Bevel and Emboss. 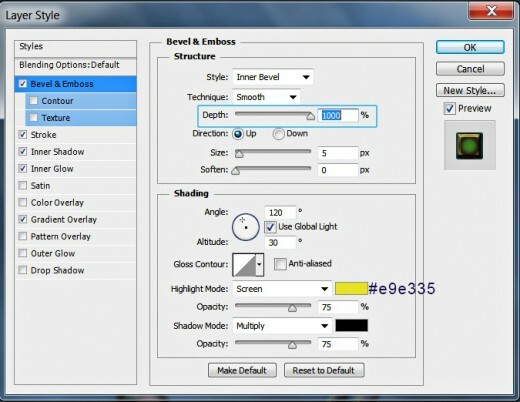 Only increase Depth to 1000% and change Color for Highlight to #e9e335. 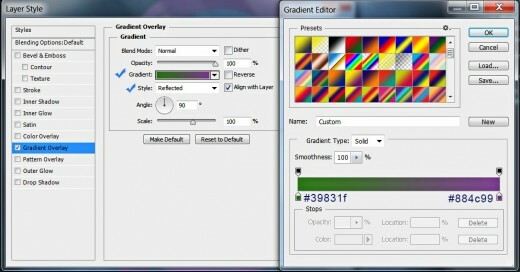 Now you can press OK button to close the dialog box and to apply the Blending Options. Our S Logo is ready. This is how it will look after the previous five layer styles are added. S Logo group with three layers in it: S, Hard Square 18px and Concentric Circles 32px. Keep the last two layers switched off. They are only for reference. 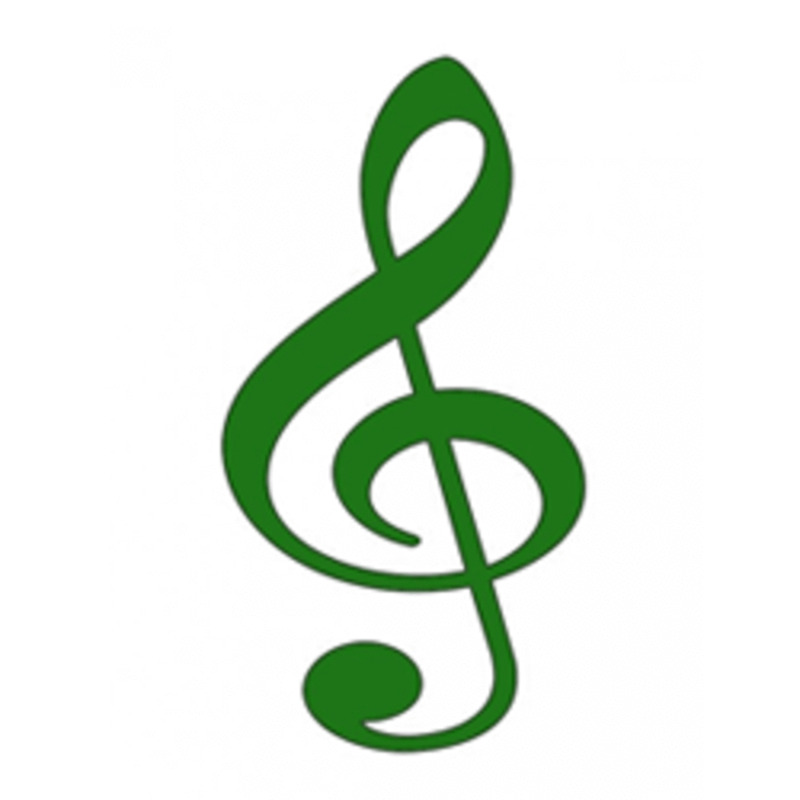 This is how the S Logo should look saved in .jpg format. 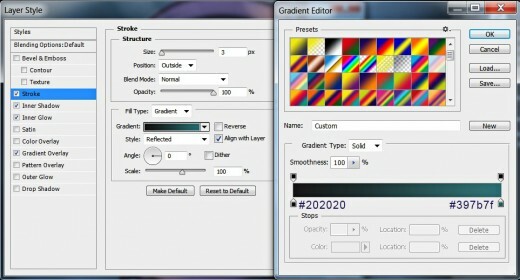 You can improve the outcome by applying Filter, Sharpen, Unsharp Mask and adjusting the settings according to your taste. Hope you liked this easy to perform Logo tutorial and learned something new. Thank you very much for reading and don't hesitate to comment and ask questions below if you need some step to be clarified. This is pretty awesome. I love the idea and people are always asking for simple elegant logos. Thanks for this. Another one to bookmark.